Computer equipment that can be refurbished or reused will be diverted to one of our many digital inclusion programs, while all remaining e-waste is responsibly recycled by one of our R2 certified recycling partners. By choosing Kramden Institute as your IT recycler, you will not only be helping thousands to cross the digital divide with the use of refurbished computer equipment, but minimizing your environmental footprint and making a positive social impact in the communities you serve. Download our Corporate Equipment Services flyer here as a reminder to yourself or to share with others. 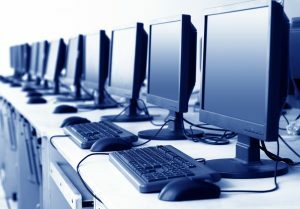 We offer free pickups for technology donations that qualify: typically a minimum of 20 desktops or laptops, based in North Carolina (we will travel out of state dependent on amount/quality of material). Our staff will coordinate pick-up time(s) and location(s) to physically remove the equipment and provide an Equipment Donation Receipt that will transfer ownership of the equipment and all data liability to Kramden Institute. Once the assets have been loaded, they are then taken directly to our secure warehouse. Please call 919-293-1133 or email us at admin@kramden.org if you have any questions or would like to schedule a pickup. Kramden is committed to data sanitization and destruction of your confidential information. We physically remove every hard drive from equipment that enters our warehouse, securing the drives in our employee-access only Data Sanitization Area, which is continuously monitoring by a closed circuit television system and alarm system. All hard drives are then wiped of their data by a 3-pass software wipe (learn more here). If a hard drive fails the data removal step, it goes into a locked storage container and delivered to our e-waste recycler where it will be physically shredded. Certificates of Destruction are given upon request. Kramden is a 501(c)3 non-profit organization. Donating entities are eligible to receive a tax deduction for property donated under applicable rules and regulations of the IRS. The charitable deduction for contributions of technology equals the fair market value (retail used value in the current market place) of the donated property.